Two Grade 3s that work in tandem with Magia and Hollow appear. AUTO (VC/RC) GB1: When this Unit attacks a Vanguard, during that battle, this Unit gains Power+4000. Magia – AUTO: [CB1] When this Unit is placed on (RC) from Soul, you can pay the cost. If you pay it, choose 1 card from your Soul, Call it to another (RC) in the same Column as this card, when that turn ends, place this Unit into the Soul. 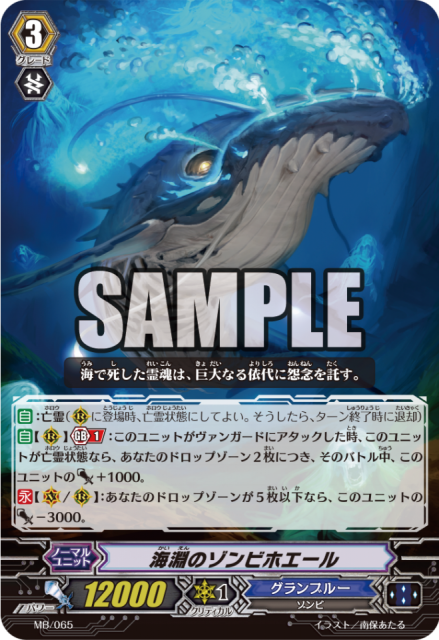 AUTO (RC) GB1: When this Unit attacks the Vanguard, if this Unit is Hollowed, for every 2 cards in your Drop Zone, during that battle, this Unit gains Power+1000. CONT (VC/RC): If there are 5 or less cards in your Drop Zone, this Unit loses Power-3000.